I am a little late in publishing this review as I encountered a few technical difficulties with the web site. In short I could no longer upload video content. After a few days of failed attempts I reach out to a Developer friend of mine who graciously pulled me out of the mud. Thanks Jordy! My apologies for the delays publishing this review. As our slogan states: In pomade we trust! 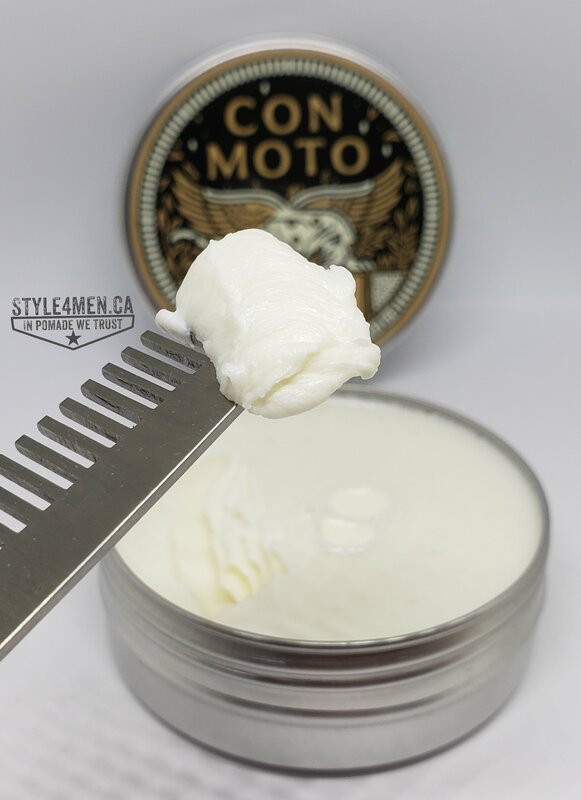 That would probably suggest that out of the full product offering from CON MOTO we would automatically jump on their pomade for our first tests and that would normally be a fair assessment. That said, we spiced things up and tried their Paste first. That might have something to do with realizing that a number of product makers are creating what is feeling like a new generation of pastes. Up until recently, pastes and creams just weren’t offering much for hair like mine in the hold and styling department. Clearly things are changing because what I got out of the CON MOTO jar was nothing short of impressive. But let’s start from the beginning. 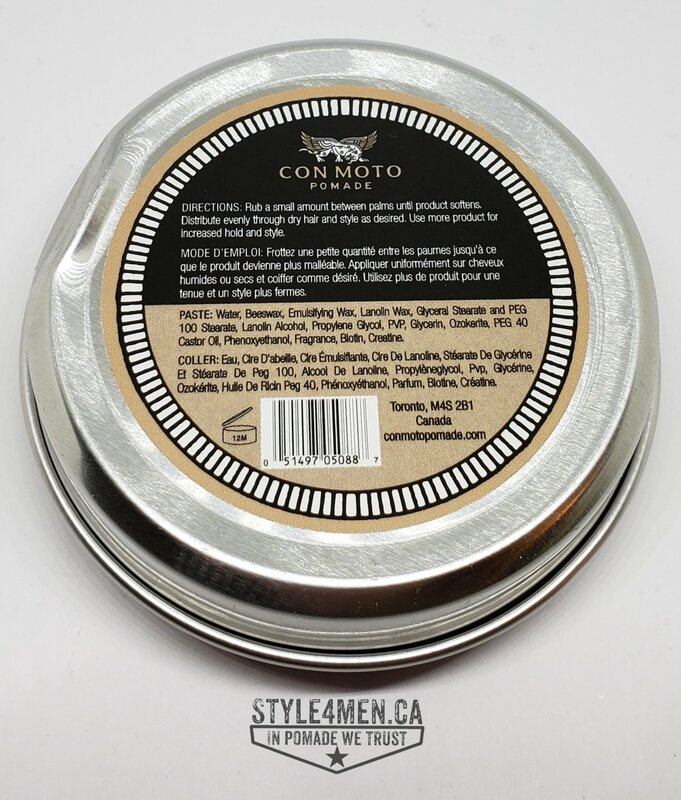 The CON MOTO branding and labeling is unique and unmistakable. That griffin opens a door for your imagination to embrace that inner strength. The griffin suggestion might go as far as letting your inner animal loose and style your hair as you see fit. Based on my tests, I will say that the griffin is holding my mope in place while I live my life. Inside the jar you find a nice white paste which exudes fantastic rum and tobacco aromas. These scents are very well gauged letting you enjoy it without imposing it on everyone around you in a 2 KM radius. Opening the jar brought me back to a happy place in Cuba in an instant. This is obviously a more mature olfactory arrangement, but being all grown up this is something you can pull off with grace and elegance. The feminine noses around me had nothing but good things to say about it. I have taken the habit of styling my hair after it has been washed and dried. I generally also use some texturizing product during the drying process to create good volume. With this being the canvas, I scooped out about the size of a dime of the CON MOTO paste. Blend the paste in my palms and apply. From side to side, back to front and finally front to back. Until now, I had found pastes to be notoriously quick to seize and thus somewhat difficult to apply. Not this stuff. It remains workable lon g enough to shape things as you see fit. I did my usual pomp. Now here is the second thing I previously disliked about pastes – the very short lived styling results. OK, so you styled your hair – great! How long is that gonna hold? The CON MOTO paste gave a whole day’s worth of commitment! Not at all what I was expecting and I totally appreciated it. The feel in hair is very smooth. You will barely feel the product. I love products like this for date night, because the last thing you want to hear is “I am not touching that!” Being a water based product, a simple shower rinse will get rid of it. Shout out and thank you goes out to Jason for trusting us for this process and making these reviews possible. In closing, the original label art work, the proper metal can, the phenomenal scent, real hold and smooth feel make it a product worthy of any gentleman’s cabinet. I couldn’t agree more with this review…Notable ‘echos’ are the great scents or rum and tobacco and the fact that it works all day long! I’ve been using this product for months now and Love it! Love the look of this product, super clean. Will be trying soon, informative review. Great professional product. Easy to apply. It never fails in assisting me to get the perfect hairstyle I desire. Long lasting hold. Great product that I strongly recommend.